This blog is no longer about non-FIFA football, but about all aspects of the international game. It's planned that occasional thoughts and pieces, of varied lengths, will be posted. Contributions are very welcome - please use the contacts on the right side of the home page. All the non-FIFA pages and posts will be kept for interests sake. Chile are coming to our televisions, and we'd be fools to miss out. It’s not a big tournament summer. The domestic season is long finished, the international break is over, and the fixtures for the next Premier League campaign were announced today, allowing football fans the opportunity to dream of what might be, come May 2018. That’s it. No senior, elite level football to be watched for weeks, it seems. Maybe bored lovers of the beautiful game will want to dip their toe in the Lions tour of New Zealand, catch the end of the ICC Champions Trophy or simply wait until it’s time for those annual cries of “come on Tim”. However, they’d be foolish to detach from football, just yet. That jam-jar of a competition, forced on to the calendar so tightly by FIFA, with seemingly no likelihood of being removed for the sake of players hoping for a summer off, is ready to go. The Confederations Cup will kick off in Saint Petersburg on Saturday, as hosts Russia take on 2016 OFC Nations Cup winners New Zealand. This tournament rarely catches the media spotlight, despite some rather open and exciting tournaments in recent years, and is ignored by many British football fans. This is both a plea and recommendation, however, to do the opposite this summer, and lap up the coming terrestrial television gift that is the Chile national team. One day, I’ll write an elongated love letter about this side. Ever since the 2010 World Cup in South Africa, I’ve been captivated by them. Their style is no doubt one for the footballing romantics. Goals, goals, goals, Gegenpressen on steroids, a leaky defence, world class superstars and the tummy-tingly suspense of never knowing what might happen when they play. They have a unique identity, that rare thing in modern-day international football. And they’ll be desperate to lift the trophy this summer. The seeds of this side were first planted at the 2007 under-20 World Cup in Canada, when a team containing Alexis Sanchez and Arturo Vidal finished in 3rd place. Those two are no doubt the stars of the current side, but there are essential players throughout, not least Claudio Bravo, Eduardo Vargas and Gary Medel, all players somewhat maligned in England. The core of this under-20 team broke a 12 year absence from the World Cup when they made it to South Africa in 2010, but after progressing out of Group H, they were comfortably beaten by Brazil in the last-16. They had 3 key men suspended that disappointing day, but the style was well in place for the future. And whose style was it? Marcelo Bielsa, no less, and it’s he who must take a serious amount of credit for what came after his 3 year tenure ended in 2010. Not an easy job to walk into, Jorge Sampaoli secured 3rd place in the CONMEBOL qualifiers for Brazil 2014, and a second successive finals appearance for this generation. They were, however, drawn in the Group of Death, with invincible holders Spain, the Netherlands and Australia. I remember the excitement the evening of their opener, against the Socceroos, vividly. The first half-hour was a relentless gush of super-Chile, and they raced into a 2-0 lead. A big score looked likely, but perhaps their biggest defensive frailty, height (or lack of), was highlighted when Tim Cahill pulled one back via a headed goal. Chile went on to win 3-1, but it was the next match against Spain that really caught the eye, as classy goals from Carles Aranguiz and Vargas saw the world champions dumped out the competition. They should have secured top spot, and a date with Mexico, but defeat to the Dutch left a mouth-watering showdown against the hosts in what turned out to be a gripping contest. Sadly, and typically heart-breaking, it was penalties that saw Chile exit, but it could have been so different had Mauricio Pinilla not agonisingly crashed a shot against the bar in extra time. There would be little time to lick wounds, though. In a years time, the Copa America was coming to Chile, and they had a date with destiny, in a competition that they'd remarkably never won. Of course, the tournament had all the rollercoasters that associate with this team, from Vidal crashing his car in controversial circumstances, to a defensive horror-show in a 3-3 draw with Mexico. However, ultimately, the side held their nerve in the knockout stages, and the late 1-0 win over a dogged Uruguay side was key. An edgy win over Peru in the last 4 meant a date with Lionel Messi and co in the final in Santiago. It was penalties again, but this time Chile won, claiming their first ever silverware and fulfilling surely the ultimate goal of this generation. The penalty that clinched it epitomised this team - Sanchez, under all the pressure in the world, dinking a Panenka past Sergio Romero. The Copa Centenario in 2016 again had the mix of good, bad and ugly, in the excessive Chile ways. Only a penalty in the 10th minute of stoppage time against Panama helped them out the group, before a simply astonishing 7-0 demolition of a solid Mexico team in the last 8. Colombia were seen off inside the first 15 minutes of the semis, and then history repeated itself in New Jersey in the final, when penalties again clinched the gold medal over Argentina. Famously, Messi retired from the international game after this loss, but is now back in the fold. His current manager? Sampaoli, who’d left Chile before the 2016 Copa, initially for Sevilla. He was replaced by Juan Antonio Pizzi, the latest man who to be set the task of maintaining this special team and their style. A second successive continental crown wasn’t a bad way to start, but a mixed 2018 World Cup qualifying campaign sees them in the 4th, and final, automatic berth at present. Of course, it’s Argentina and Sampaoli who sit one place behind them, and a fascinating end to the qualification awaits. Before that, though, is the Confederations Cup. For a nation so overjoyed to win that first continental crown in 2015, there'll be little need for motivation to reach for more gold in Russia. Their last warm-up game against Romania was a microcosm of this team; two sumptuous goals giving the South Americans a two-goal lead, before a rearguard collapse ended in a 3-2 defeat. The defensive importance of Medel was evident - Chile were ahead before his first-half dismissal. In Russia this month, Europe will offer the main threat. Germany will always be contenders, and there’s no doubt a certain Mr Ronaldo will be keen to claim yet another career medal. The Germans and Chile are together in group B, along with Australia and a weak Cameroon, who the Chileans meet in their opener on Sunday. Entertainment is almost guaranteed - the averages for the 16 matches they've played over the course of the 2014 World Cup, and 2015 and 2016 Copa Americas read as 3 goals per game, and over 2 scored by Chile. This side needs more dedicated to them than this all-to-brief assessment of the past decade There’s no doubt others have told this story, or parts of it, and in better ways. What I’m trying to get across is that this side are a pure pleasure to watch, gripping, and unpredictable. And you’d be foolish to miss out on the free offerings on your TV this summer. Kosovo have confirmed May matches with Turkey and Senegal as they make the most of FIFA's allowance for them to play friendlies with their members. 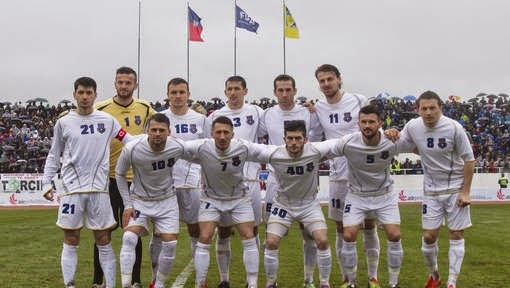 They will play the Euro 2008 semi-finalists in Mitrovica on the 21st before travelling to Geneva on May 25th where they will face the Senegalese. The northern city of Mitrovica was home to the 0-0 with Haiti last month and the historical ties with Turks and Albanians make the game a fairly predictable one. Senegal are preparing for the 2015 African Cup of Nation qualifiers and the game in Switzerland, a country home to an estimated 150,000 Kosovar emigrants, should attract a big crowd. The Kosovo squad is expected to be similar to the one that played last month though Manchester United's Adnan Januzaj could feature after his father Abedin is reported to have said "my son will play for Kosovo or Turkey". The draw for the first ConIFA World Football Cup took place today with hosts Sápmi meeting Occitania and Abkhazia in group B.
VIVA World Cup holders Kurdistan are alongside Aramean Suryoye and Tamil Eelam in group A, with group C to be contested by Padania, Quebec and Darfur. Group D, arguably the easiest looking pool, will feature Zanzibar, Nagorno-Karabakh and Ellan Vannin. The hosts squad is anticipated to be extremely strong with Club Brugge defender Tom Høgli expected to play. The Lapland side have meet the Occitans twice before, most recently in 2012 when they lost 3-2. Group A is an all Asian affair which will be dominated by the Kurds and 2008 VIVA World Cup runners-up Aramean Suryoye. The sides met in 2008 drawing 0-0. In Group C none of the teams have previous meetings but 2012 VIVA World Cup whipping boys Darfur could be on the end of some heavy scorelines against the powerful duo of Padania and Quebec. The final group is perhaps the most open with each side likely to fancy their chances of making the quarter-finals. The full fixture list will be published next week. After the draw Aramean Suryoye FA president Melke Alan said "it's tough but it's good to play the hard teams [Kurdistan]". Sapmi FA president Håkan Kuorak was equally positive saying "I expect us to be better than Abkhazia for sure". 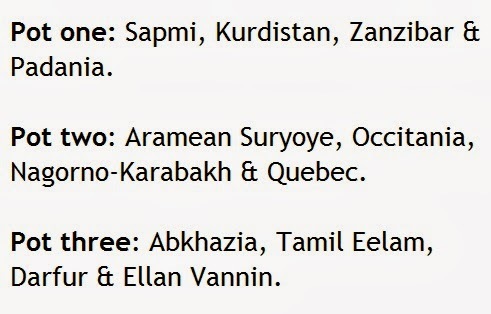 Group A: Kurdistan, Aramean Suryoye & Tamil Eelam. Group B: Sapmi, Occitania & Abkhazia. Group C: Padania, Quebec & Darfur. Group D: Zanzibar, Nagorno-Karabakh & Ellan Vannin. Monaco will travel to Rome on May 10th to face the Vatican City as the two microstates meet for the fourth time. 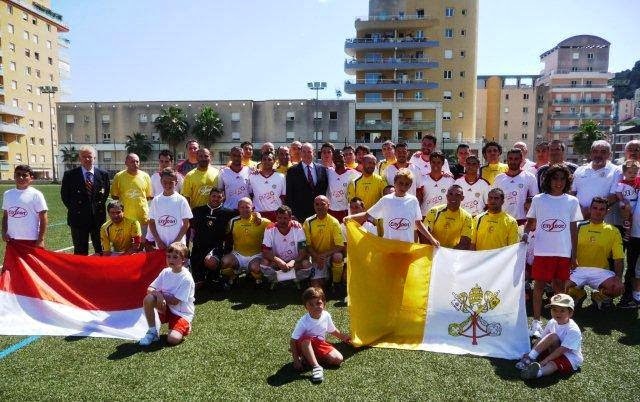 The game will take place at 20:00 at the Stadio Petriano in Pontificio Oratorio San Pietro, the Vatican's sport complex, which plays host to Vatican domestic matches. With no pitch within the Holy See the smallest nation in the world play ‘home’ games in Rome with both a 2-1 defeat to Monaco in 2011 and 0-0 draw 9 years previous coming at the Stadio Pio XII. The Vatican travelled to the French Riviera for a first away game last June as they went down 2-0 after first-half goals from Morgan Escarras and Eric Fissore. Monaco have stepped up their non-FIFA activity over the last 18 months playing games, both of which ended in defeat, against Raetia and Provence. The win over the Vatican was their last outing and they will travel to the Isle of Man in April as the opposition for the newly formed Manx Ellan Vannin team. The Monegasque also have plans for an August game with Sealand and potentially Seborga after the Italian micronation recently founded a new football organisation. Gibraltar will host Malta in a friendly on June 4th as the new UEFA members look to prepare for their first European Championship qualification campaign later this year. The game will likely take place at the Victoria Stadium which was the venue for Gibraltar’s back-to-back defeats to the Faroe Islands and Estonia earlier this month. With the Estádio Algarve in Faro, Portugal Gibraltar's home ground for the European Championship qualifiers there's a chance the game could be played there. The non-FIFA side travel to Tallinn on May 26th before the Maltese, who lost 2-0 to Albania in March, travel to the Mediterranean for a first meeting with Gibraltar. The Gibraltar Football Association no doubt see the game as an opportunity to gain a positive result on the back of the disappointing results during the last international break. The draw for the maiden ConIFA World Football Cup takes place on Monday in Sweden with the new non-FIFA governing body set to reveal the groups for the 12 competing teams. ConIFA World President Per-Anders Blind will conduct the draw in the southern Sami city of Östersund, which will stage the finals, alongside organisation CEO Johan Bexelius. Of the 12 participants 8 have played at a VIVA World Cup before with Quebec, Ellan Vannin, Abkhazia and Nagorno-Karabakh the exceptions. Hosts Sapmi, winners of the first VIVA World Cup in 2006, will be in pot one after each competing association agreed on a seeding system which will see 3 groups of 4 play out before quarter-finals, semi’s and placement games. 2012 VIVA World Cup winners Kurdistan are expected to join them in the first pot alongside 3-time VIVA champions Padania and CAF members Zanzibar. Pot two is expected to contain the Quebecois, 2013 Tynwald Hill Tournament winners Occitania and 2008 VIVA World Cup runners up Aramean Suryoye. Nagorno-Karabakh will make up the second seeds despite the Azerbaijan FA complaining to FIFA about their participation. The final pot is set to include Abkhazia, Darfur, Tamil Eelam and Ellan Vannin. The latter host Monaco in their first international in April and members of the Manx Independent Football Association will travel to Sweden for the draw. Kurdistan, Aramean Suryoye and the hosts will also send delegations to the draw which is set to be conducted in the Jämtkraft Arena, home of Swedish second-tier side Östersunds FK, at 14:00 local time. The tournament, which has in effect replaced the N.F.-Board’s VIVA World Cup, is set to be the largest non-FIFA event in history. It begins on June 1st and concludes on the 8th. We will be covering Monday’s draw via our Twitter service.